On Saturday I spent most of the day sanding away on the S13 I hate when people rattle can cars it just makes so much more work when you want to actually paint it. 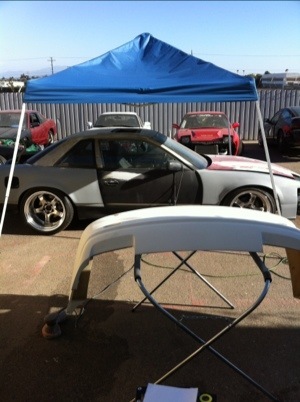 I also did a little of the body work that needed to be done and final fitment on the rear fenders. Everything is welded up and the fenders are staying on the car! Still have a little bit of cleanup and a couple small dings I need to fill and then I can hit the car with a coat of high fill primer and then even more sanding after that! But it’s getting there hopefully it will be painted soon. 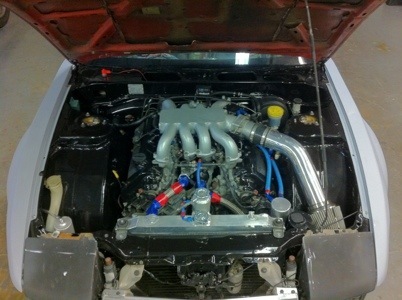 Also cleaned up the engine bay and took a couple of pictures since I haven’t had it clean since it was finished. ~ by B. Rogers on July 30, 2012.